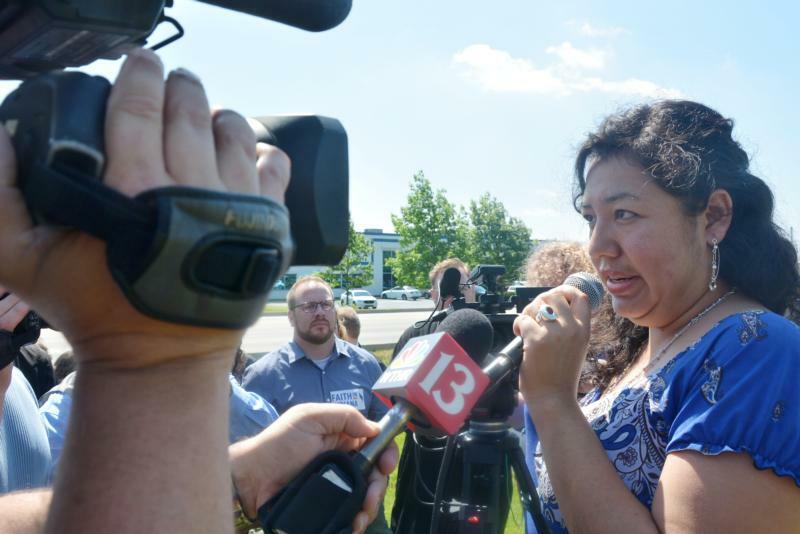 INDIANAPOLIS (CNS) — After standing in sweltering heat for 40 minutes, dozens of supporters cheered as Erika Fierro emerged from the building May 31. That she exited through the front doors was a good sign. It meant that she was not being deported to Mexico — that day. “They gave me a date to leave next month, (on) June 26,” Fierro told those present. “They” are the officials of the Intensive Supervision Appearance Program, or ISAP, and she had just met with them in Indianapolis. But she made the statement with a strained smile. “It’s still not enough time for me to get my kids’ passports to take them with (me),” said Fierro, the 35-year-old mother of two children, ages 3 and 8. Their father and Fierro’s husband, Jesus Pena Rodriguez — was deported to Mexico several weeks earlier. With Fierro leaving June 26, the children will be separated from both parents until their passports are issued, said Fierro. Paperwork her husband is required to sign and have notarized is not expected to reach him until July 2. Both Fierro and Rodriguez were born in Mexico. Fierro was brought to the United States at age 5 when her parents emigrated, and Rodriguez entered the U.S. as an undocumented immigrant in 1988. Their current trouble started in early April when the couple, members of St. Patrick Parish in Indianapolis, was confronted by Immigration and Customs Enforcement officers outside of their Indianapolis home as Rodriguez was leaving for work. The incident was the result of something that occurred 11 years ago. In 2007, the couple had returned briefly to Mexico. They were captured by Border Patrol agents as they re-entered the United States, and were consequently officially deported to Mexico. They then re-entered the U.S. again, which is a felony for those previously deported, according to Title 8, section 1326 of the U.S. Code of Law. During the April incident, ICE officials immediately arrested Rodriguez. Fierro was allowed to stay with their children, but has been monitored through ISAP while awaiting a ruling on her status. The week prior to the May 31 meeting, she was given the final decision: She was to be deported, with the date still undetermined. She believed her removal would occur during her May 31 meeting. The night before that meeting, she gave an interview with The Criterion, newspaper of the Indianapolis Archdiocese. Fierro explained there had been a holdup on her children’s passports — a holdup that she believes could have been avoided. But he never received the documents, she stated. Rodriguez now needs to sign the passport-related papers in front of a notary in Mexico, she said. To do so, she continued, he must show his Mexican identification papers. Fierro said he will not receive those papers until July 2, making it impossible for the children to have their passports by her June 26 deportation date. At a news conference right before the May 31 meeting, she told reporters: “I have not asked for much, but to keep my kids, my two U.S. citizens, together with me. I pray that my children do not go through being separated from both of us. Archbishop Charles C. Thompson of Indianapolis spoke briefly before praying over Fierro at the end of the news press conference. Afterward, he spoke to The Criterion. “As the church has always taught, the family is the fabric of society. As the family goes, so does society. “Each time the family is being divided or disintegrated or harmed in any way in our society — whether it’s through deportation, or drugs, or alcohol, or abuse, or violence — each time that happens, society loses and humanity loses,” he said. Fierro’s immediate concern was her children losing both parents, even if only temporarily.